Zerto Virtual Replication 4.5 has been released and has quite a lot of new stuff under the hood that we’ll have a look today. For those of you that deployed/tested Zerto there are very good news. Zerto’s deployment is getting deployment options without needing/asking you for root password for hosts. But one of the major fine-grain and crucial features for every customer is probably Journal File Level Recovery allowing to recover Individual Files from a journal. 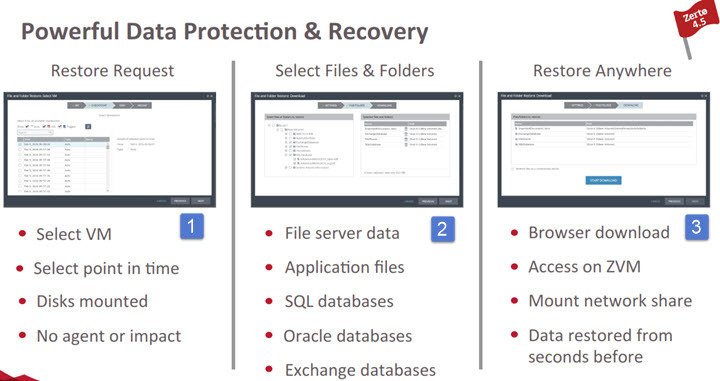 Previously you could already recover a full site, application(s) or VMs, but the additional granularity giving you a possibility to recover files within the Zerto UI is something that’s a real step forward. When you think that Zerto can rewind back in time (The journal is kept maximum 2 weeks), you have a chance to “lose less” data (if any) as Zerto’s RPO is usually in seconds. If you have a problem, and when you’re hit by virus, spyware, crypto locker etc…. then the RPO counts! 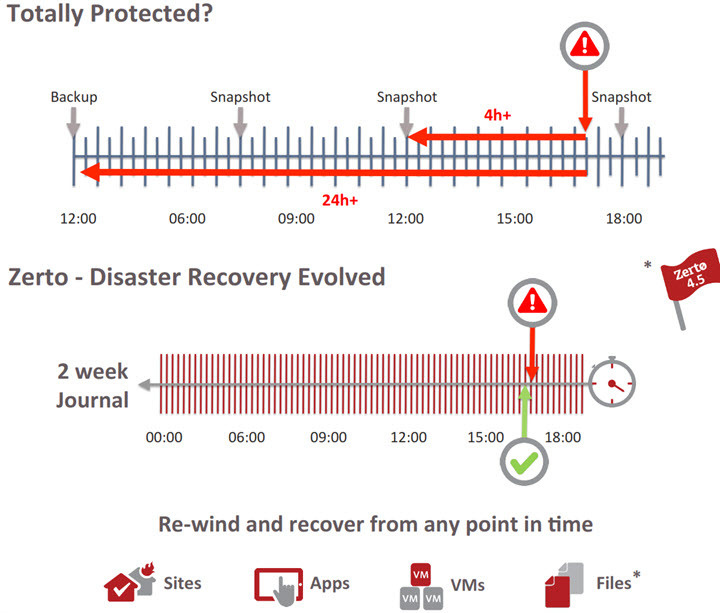 Traditional backup products which are using hypervisor’s snapshot technology and in case of VMware, a CBT (change block tracking), then those backups aren’t usually scheduled that often…. New Installer – more robust, more resilient. More VRA deployment capabilities – the VRA is deployed by VIB so it’s resilient to pasword changes. Role Based Access Control – integrated in ZCM. Now, there is an AD integration, and you can control View, Edit, Test and Falover/move per VPG. Even without using vCenter you can still provide role-based access control. Compressed journal – more efficient recovery sites consuming less storage space. Feature Resiliency Improvements – extended network outage now does not need admin’s intervention. Add VMs to VPG keeps track of that point in time precisely and keeps VMs in sync. APIs – manage VRAs by APIs allows automating. The Zerto Journal at the recovery site is now compressed to save space. Previously the data compression was done before the data was sent over the WAN, but then at the target site the data were uncompressed, and it would go along with the data disk. The journal has had about 20 % overhead. Now when there is only about 10% overhead compared to the size of data at the source site. Nice data reduction indeed considering that larger environments with thousands of VMs will obviously have higher savings. You can add VMs to VPG – previously when you added another VM to a VPG (Virtual Protection group) it did triggered a re-sync of the VPG. Now, in 4.5 it does not trigger VPG resync, but it account the new VM added to the VPG but also it will keeps track of the protected number of VMs in that checkpoint. So when now you have, let’s say 2 weeks journal and you add let’s say new VM where you already protecting, let’s say 6 VMs. So the 7th VM will at some point start to be protected as well. And as the time goes by day after day, that 7th VM will have more and more time of being protected for finally 2 weeks later all synced. Extended Network usage – if your network outage is longer than your default SLA, (Example: your SLA is 4h and your network outage is 4h) then you can still recover without manual intervention (which was the case for 4.0). Change Recovery Target on Down Host via UI – if you have a host which is down. The host has had a VRA. You can now change the recovery target through the Zerto UI. 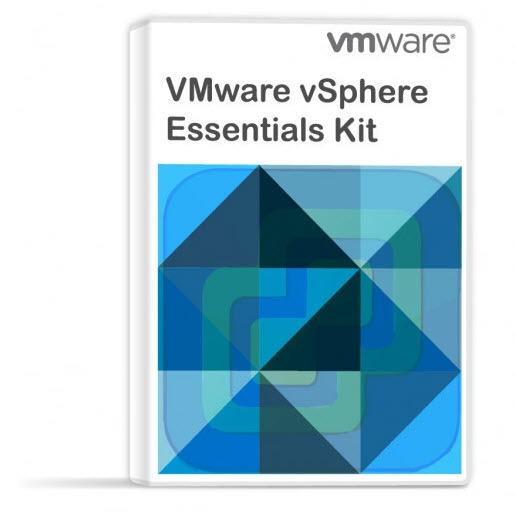 Ghost VRAs – In case VRA cannot see its disks (VRA is a simple VM). Zerto call it “Ghost VRA”, but Zerto now has a “cleanup” procedure to clean this VM. Zerto is API driven. Newly released APIs allows some interesting possibilities when it comes to automation of creation of VPGs and managing them where you’re able to change for example the networking settings, manage VMs that are in the VPGs, change datastores, IP addresses…. 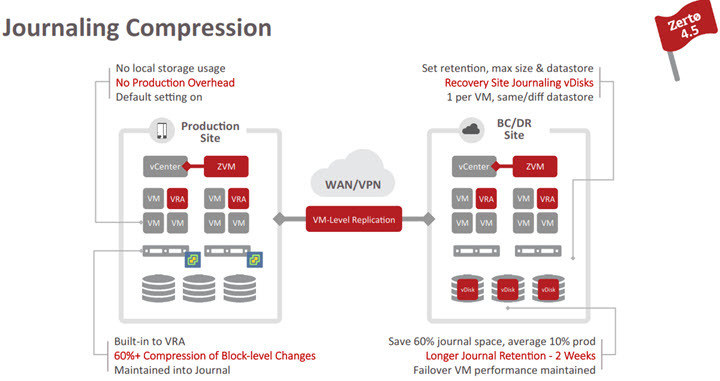 Zerto Virtual Replication 5.0 – What’s New? Download Zerto Trial from their website.